Coronado Heights castle and, in the foreground, one of the picnic areas. Spanish explorer Francisco Vasquez Coronado, in search Quiveria and the Seven Cities of Gold, came to the Smoky Valley in July, 1541. Coronado noted the fertile soil of the valley in his journal indicating it would be perfect for growing grapes. 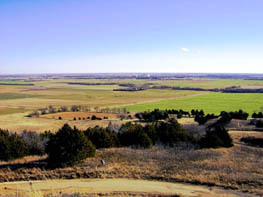 The highest point in the Spanish Buttes located to the north and west of present-day Lindsborg is Coronado Heights. The hill, which rises 300 feet above the valley floor, is owned and maintained by the Smoky Valley Historical Association. The winding road up Coronado Heights takes you to a picnic, hiking, biking, and sightseeing destination which has been enjoyed by local residents and visitors alike for generations. 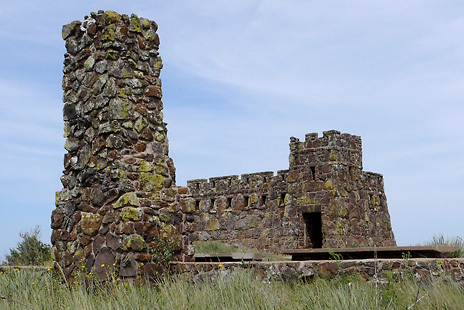 During the Great Depression the federal government-sponsored Work Progress Administration (WPA) built eating and cooking areas of native sandstone around the top of Coronado Heights in addition to a castle honoring the Spanish explorer. The castle provides shelter with a large interior room featuring a table and a fireplace. It's topped with an open-air second floor roof, accessible by stairs, providing a spectacular view of the valley and beyond. At night the city lights of Salina, approximately 12 miles to the north, and McPherson, around 20 miles to the south can be plainly seen from the top of the castle. Groups are welcome to use Coronado Heights for meetings, outings, and special events. Contact the Lindsborg CVB office for information on obtaining permission to use the Heights for these occasions. Informal visits and family gatherings are always welcome and do not require prior approval by the SVHA. Coronado Heights is patrolled by both the Saline County Sherriff's Department and the Lindsborg Police Department. The rules and regulations for the use of the Heights can be found in the Coronado Heights Use Policy. An early postcard depicting the castle from a picnic area on the perimeter of the hill. 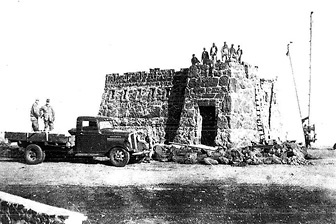 WPA workers building the castle during the Great Depression in 1936. 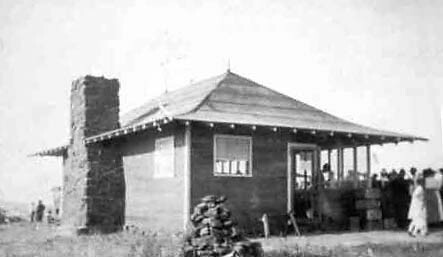 The central picnic area under re-construction by WPA workers in 1936. As seen in the photograph below, this area was once an enclosed structure made of wood. The wooden sections become the victims of the weather and vandalism over the years. 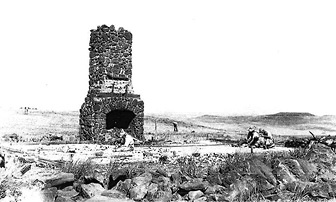 This is the picnic and cooking area on top of Coronado Heights when the wooden walls and roof were still standing. 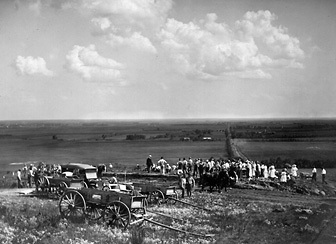 The photo was taken during a community celebration, most likely over the 4th of July in the mid-1920's. 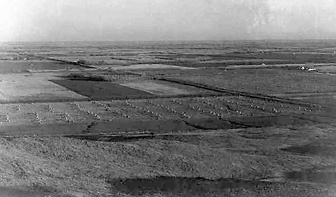 An early aerial view of Coronado Heights and the Smoky Hill River Valley. The year it was taken in unknown. This is a view of the Smoky Hill River Valley as captured by long-time Lindsborg photographer B. G. Gröndal in the early 1900's. This is a modern day view of the Smoky Hill River Valley taken in 2013. 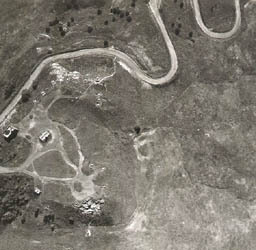 As SVHA-sponsored improvements were made to the hill in the mid-1920's the name was officially changed to Coronado Heights. Prior to that the hill was referred to variously as the Spanish Buttes, still the name for the smaller hills surrounding it, or Smoky Hill. It was at this time the first road was constructed and named "The Swensson Drive" in honor of the founder of Bethany College and Bethany Church pastor, Carl Aaron Swensson, who died some 20 years earlier. A sculpture by John Whitfield was placed along the road half way up the hill in 1988. The front features a cross and a sword and the words "Coronado" and "1541." On the reverse in small letters is an inscription that sums up Coronado Heights, "A Place to Share."